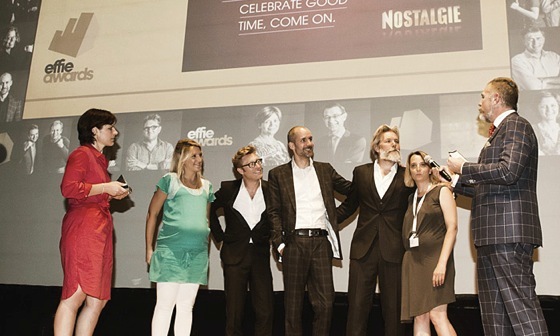 Radio Nostalgie (Gold), De Lijn (Gold), Febelfin (Silver), Centrum van ter Preventie Zelfdoding (Silver), KBC Bolero (Bronze) and Bpost (Bronze) are the 6 Effie Awards winners of the 27th annual Effie Awards Belgium competition. The Effie Awards honor marketing communictions efforts that have proven their effectiveness. The Effie jury, composed of advertisers, agencies, universities and market research offices awarded 6 total winners this year. "What makes [the] Effie Awards unique is the emphasis on campaigns that work." Based on facts and figures, the winners demonstrate their expertise with their views of the market, strategy, creativity and measurability forming a fundamental basis. "The high demands we ask makes the prestige of the Effie Awards particularly large. The importance of effectiveness in marketing and advertising continues to grow every day, especially for the authenticity and strength of a brand…" said Birgit Heymans, manager of the Effie Awards Belgium.